Hello fellow Walkers! 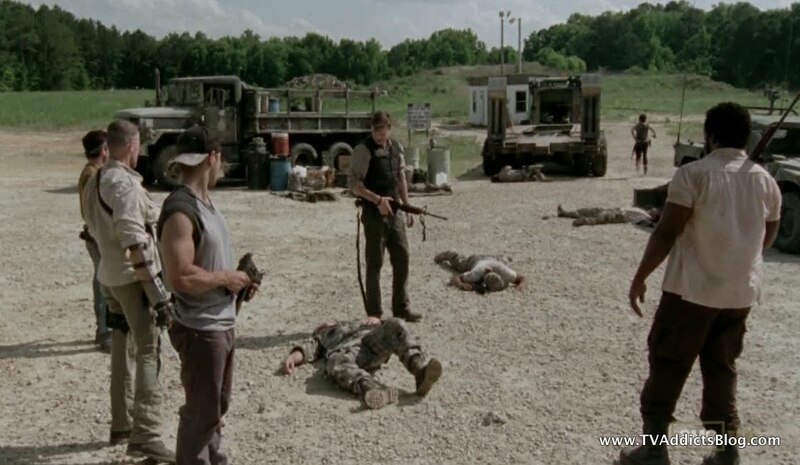 Last night's episode was the first time that we took a detour from the main group, especially Rick. But, it didn't make the episode any less interesting. And obviously, the paths will eventually intersect. 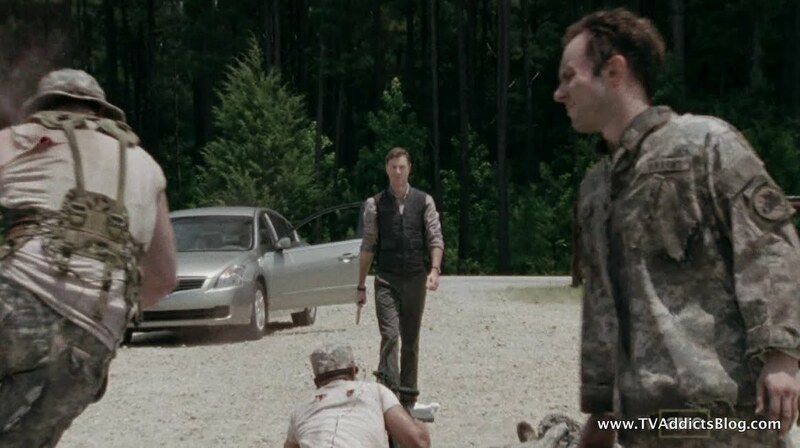 There are some shady things going on in Woodbury, don't you think!? Anyway, we'll get right into it in a second. Just wanted to post a disclaimer on Hurricane Sandy which is starting it's path into the Northeast, where this blogger resides. We still have power, so I should be good to get this recap up (obviously, if you're reading this then we're all good). Watching Revolution tonight and writing about it could be a totally different story! Of course, when mother nature decides to wreak havoc on certain parts of the world, it should be acceptable for things like blogging a TV show to take a back seat, right!? Okay now that that's out of the way, let's blog a TV show! This entire episode was built around introducing us to one of the most formidable foes of the comic books. Probably even most non-comic readers (as I am) have heard this name thrown about over the past 3 years. THE GOVERNOR!! Apparently, the TV Show governor has taken a different approach than the comic book governor. He's more subtle in his creepiness. But, that certainly works so far! 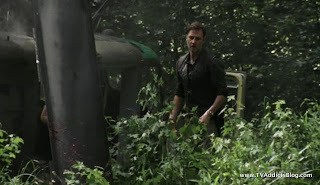 The show opened up with a helicopter malfunctioning and crashing into the woods. 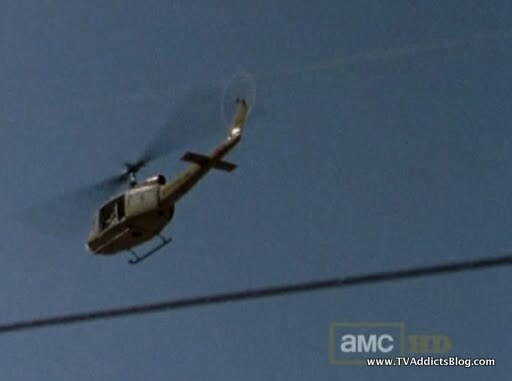 Was this the same helicopter that Rick saw in the pilot? It's possible. But this is 9 or 10 months after that. We also learned last season that that walker herd that made its way to the farm initially followed the sound of a helicopter out of Atlanta. It would be nice to be able to tie these 3 events together. Anyway, Andrea, Michonne and her pet Walkers saw the chopper crash and moved towards it. But, they weren't the only ones. Ol' Guvna and his cronies came in their military vehicles to check out the scenery. 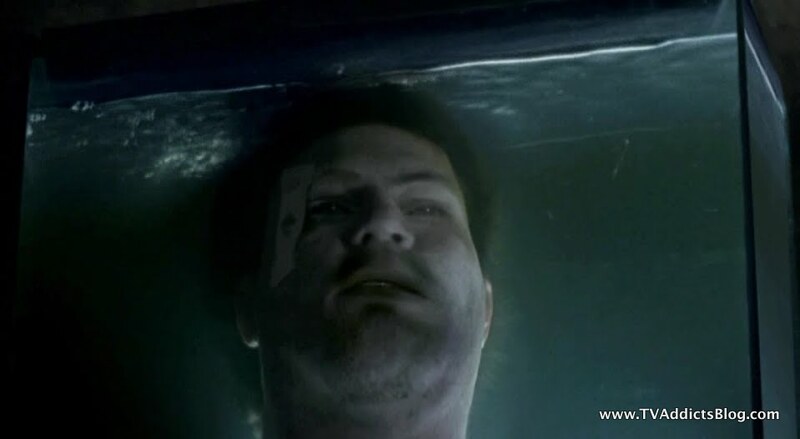 There was a dead man from the chopper cut in half. We knew he was coming back, but Andrea/Michonne did not. Andrea wasn't around when Rick revealed the news that Jenner whispered to him at the end of season 1. 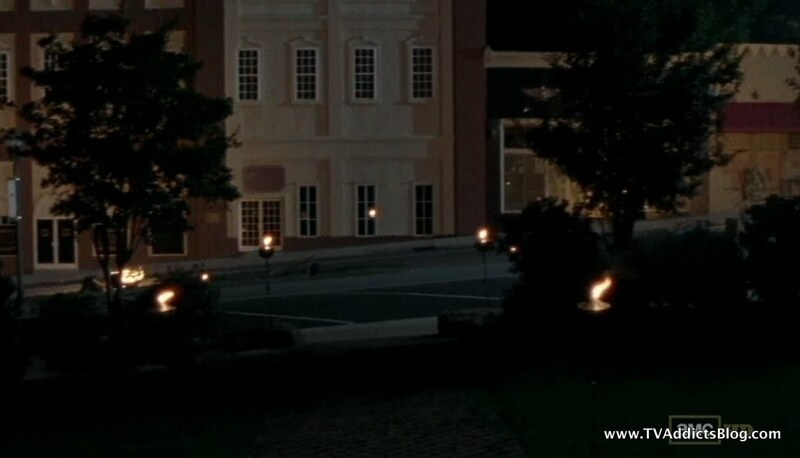 When the Governor was approaching, Andrea and Michonne went into hiding. He proceeded to stab the 2 deceased chopper passengers in the head for their 2nd deaths. Andrea and Michonne were mortified. There were several other walkers attracted to the area. 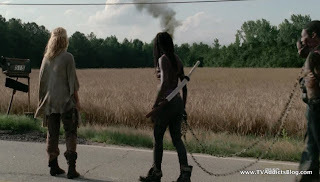 They walked right through Andrea/Michonne and the pet walkers without even a whiff of human flesh. Thanks pets! The Gov's cronies methodically took them out with bats and bows. But then the pet walkers were making lots of noise. Michonne had no choice but to slice their heads off. Awww man! 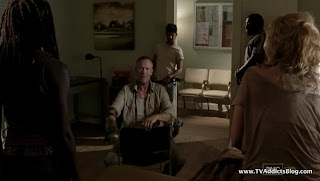 But, then in the most anticlimactic reveal of all time (it was in the previews), Merle Dixon returned! He's alive! He's handless. He has quite the weapon where his hand used to be. He's still the same ol' Merle. Turns out he is working for the Governor as well. He took a sickly Andrea and Michonne in. They were blindfolded (similar to Rick blindfolding that kid from the bar attacks and bringing him to the farm) and brought to Woodbury. 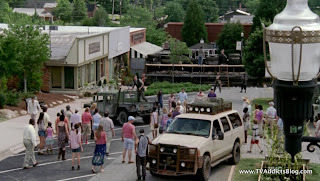 Woodbury appears on the exterior to be a safe haven from the walkers. A place where the human race can continue and possibly grow yet again. Of course, good luck with everyone being infected already! 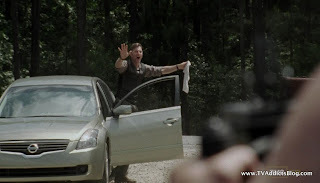 So, several things were going on in Woodbury, and I'm just going to list them in bullets as I so often do! Merle and Andrea catch up. Andrea talks about how she feels his pain of being abandoned by the group. They got separated 7 or 8 months ago during the farm invasion. Merle talked about how the governor found him when he was knocking on death's door, almost bled out. Andrea talked about all of the deaths they have suffered from season 1 on. I don't remember her mentioning Shane, but she may have. She does end up thanking Merle in the end of the conversation. The Governor comes in to give his recruitment speech to Andrea/Michonne. They feel like they are imprisoned even though Andrea is being nursed back to health. They also want their weapons back. Gov says they're free to go and even offered them supplies and possibly a vehicle. But, he keeps hoping they'll change their mind after they hang out for awhile. There is a strict curfew in place. No one goes out after dark, and there are guards at the gate to take out any "Creepers". 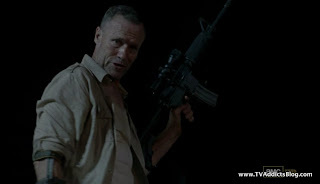 We saw that Merle is quite good with a sniper rifle taking out a few of them that showed up. Governor also spilled the beans on how they're all infected. They didn't focus too much screen time on Andrea and Michonne's reactions, but they did mention it's a tough pill to swallow however you learn it. Andrea seemed to be an easier sell than Michonne. 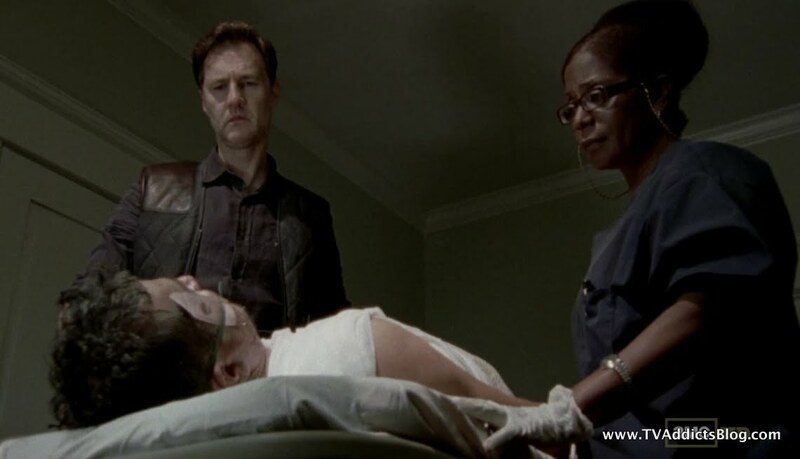 She totally doesn't trust the Governor. 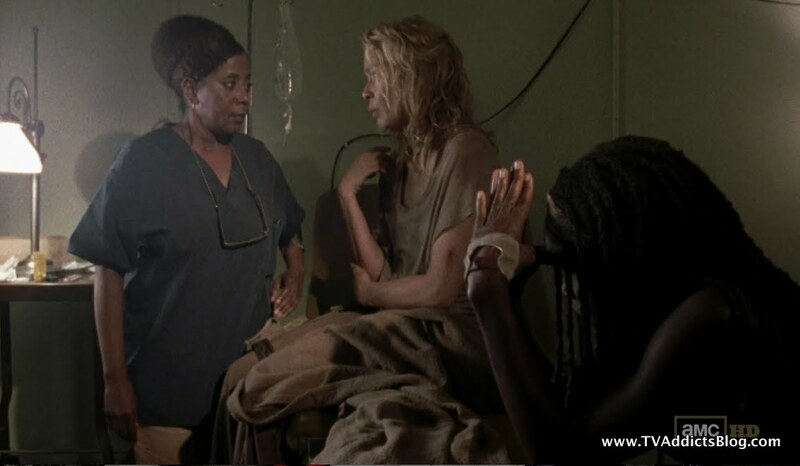 We also find out that Andrea and Michonne may not be as close as we thought. Andrea seems to have dumped our soul into conversations, but it's been one way. Michonne hasn't revealed much about her past, even who her pet walkers were. She claims they were meaningless to her. But Andrea, and even the Governor think differently. Meanwhile, Governor is gathering intel on their new guests. 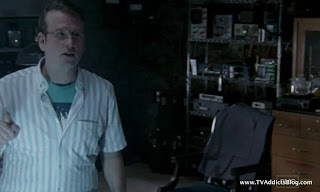 He had his dorky scientist guy investigating the pet walkers. We learned a lot of what we've speculated or found out from the comics. No jaws, no arms so they can't attack or bite. They lose their hunger. But, having them around acts as a camouflage for humans. Gov thought this was ingenius. We also found out that the walkers can die also from starvation, but at a much slower pace than humans. Interesting. 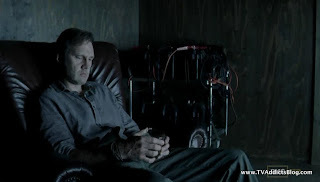 Gov asked for all the intel he could get on Andrea from Merle. 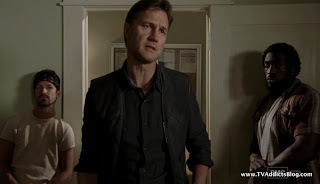 He wants more information on his brother Daryl and what Andrea knows of the group. Possibly looking to eliminate more threats? Why do I say more? Oh right, I haven't gotten there yet. But, while we're on the subject, I assumed it was the Governor or one of his cronies scoping out the prison in the last episode. Maybe that scene happened later in chronology to this stuff we're seeing in this episode. Or maybe they've been keeping their eye on the prison already. The governor also questioned the pilot of the helicopter. I rewatched the scene since I typed my above statements. It is very likely it's the same helicopter. 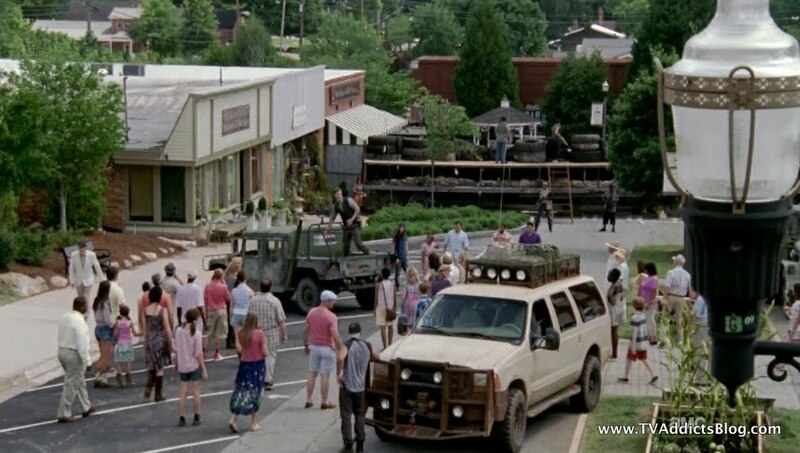 It would appear they had a camp very much like Woodbury. People were safe, food was lasting. I'm sure they sent the chopper on scouting missions on occasion, which is when Rick saw it and when the herd of walkers saw it. Anyway, a walker somehow got inside and bit someone and the place went to hell very quickly. The pilot rounded some of his men and fled. There were about 10 of them. They got about 60 miles from the camp but then had to take to the sky to scout ahead. The chopper took a beating but they had no choice. The Governor promised him that he would find his men and bring them in. It looked like Michonne spotted her sword during this breakfast too. It was in his house and not at the gate as he mentioned earlier in the episode. 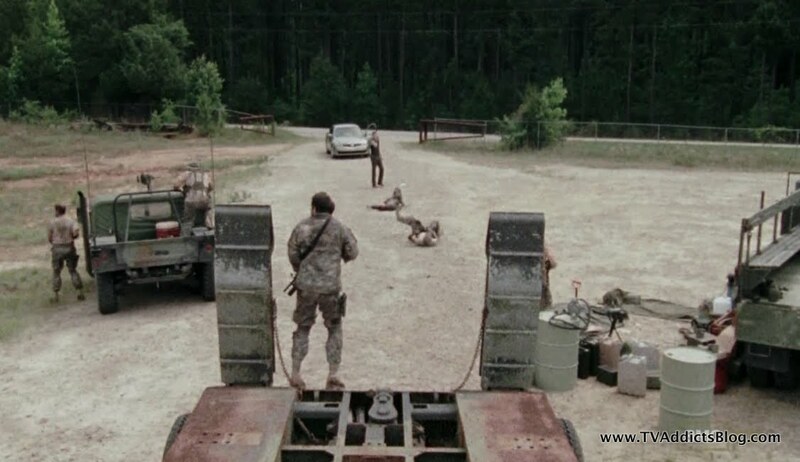 Okay, so we see the Governor speed into the military encampment that the pilot described. He sported a white flag of sorts suggesting he came in peace. He told them about their pilot and how he's in their town and badly hurt. 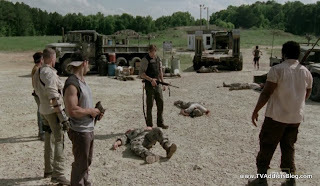 Just when they were all getting their hopes up, Governor shot one of them, and the rest were taken out in an ambush from the woods. And just like that, we see the Governor's true colors. But, is it any different than how Rick treated his visitors in the prison? 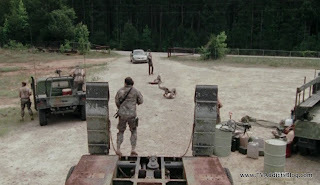 These people had actual military experience and weren't trained to use weapons post zombie outbreak like Gov's people. If they brought them in, there's a good chance they would take the place over eventually. So, the Governor took out his threat. Of course, he also got a lot more weapons and supplies. He talked about them finding weapons over time. But, maybe this is how they keep Woodbury up and running. Of course, it would seem the townsfolk of Woodbury (73 people) are under a different impression. The Governor came in and talked about how they met the convoy and how he had promised he would bring them in alive. But they didn't have their walls and fences and the virus got to them. So, he keeps his people in line by lying to them. Andrea seems to be a convert for now. She has a quick chat with the Governor and asks him for his name. He says that he never tells. Andrea said "never say never." Of course, I loved his response to that. "Never." Good times and creepy of course. If he wasn't already shady enough, we see how the Governor unwinds after a long day. We see a naked girl in his bed. 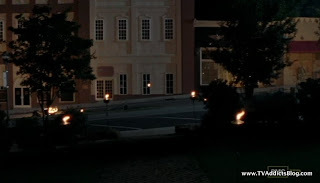 It appeared to be the girl showing Andrea and Michonne around during the day. 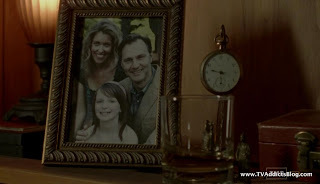 And of course, there's a picture of his what we would assume "pre-outbreak family". A wife and kid. And then, he goes into a dark wood paneled room, takes a seat in his leather chair and stairs at his WALK-AQUARIUM. There are heads of many many walkers lit up and floating around in front of him. 2 of the heads were Michonne's pets. Who knows, his wife and kid might be in there too. 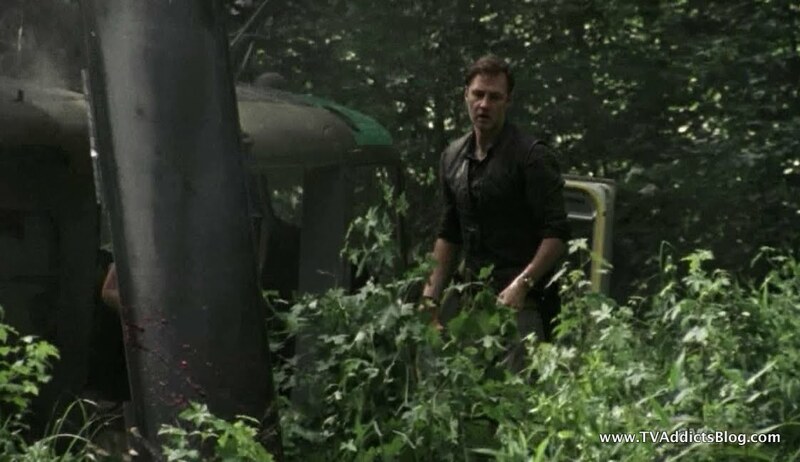 And of course, the pilot's head, implying that Governor or his people killed him. WHAAT!?!? So yeah, he may be making unpopular decisions to keep his group fully functional, but the aquarium scene adds a whole new level of sick and twisted to this guy!! Crazy crazy episode, and I can see this getting even crazier as we progress through the season. That's all I have for today. As I mentioned, I'll be out of town this weekend, so I probably won't be getting to do a full recap. Once I watch all of my shows from the weekend and Monday I'll probably post a quick thoughts post on our 3 recapped shows. Next weekend, I'll have similar issues but it may only impact Fringe. We'll see! Hope you enjoyed my ramblings and I'll see you soon! Hmmm, I thought I noticed it but didn't mention it in the recap. Those Zombie heads were "LIVE" as mentioned in the interview. Interesting. 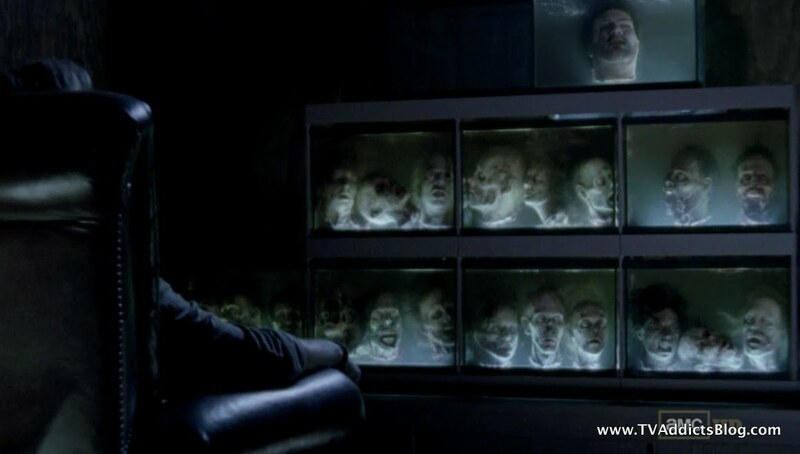 I wonder if this will go further into investigating if the walkers have these ECHO's of their former life. 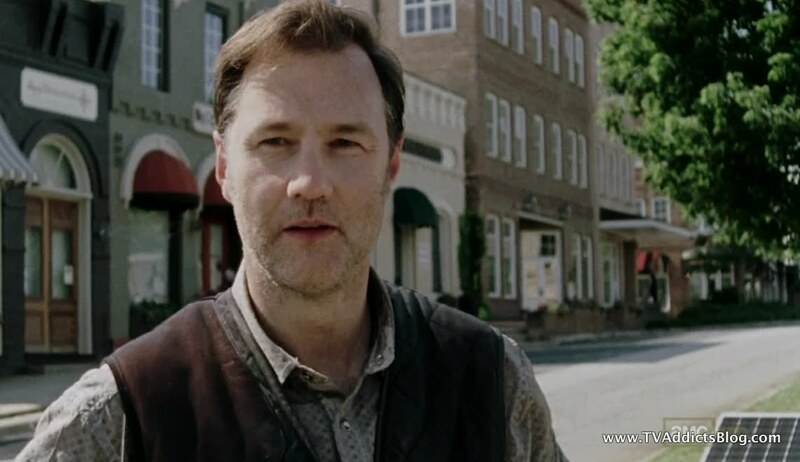 After all the talk about the Governor and Woodbury, I’m glad we finally got there. I kinda got a Stepford Wives sense of Woodbury. It all looks nice on the surface, but who knows what crazy things are really going on there behind closed doors! I don’t know anything about the comics except what I read here or hear on Talking Dead, but obviously they just cracked the surface on the Governor. What's the big deal about him not wanting to reveal his name? I’m also curious about the backstory with Michonne’s pets. And, they said there’s a baby on the way in the town, but if they are all infected, we still don’t know what that means for a baby. It will be interesting to see how they bring these groups together. Our thoughts are with all of you in the northeast. Stay safe! Great start to this season, especially as we're getting some fresh meat with new characters and lots of potential for interesting storylines. I definitely got the 'too good to be true' feel with Woodbury so I was waiting for the other shoe to drop. Super creepy at the end with the floating heads. 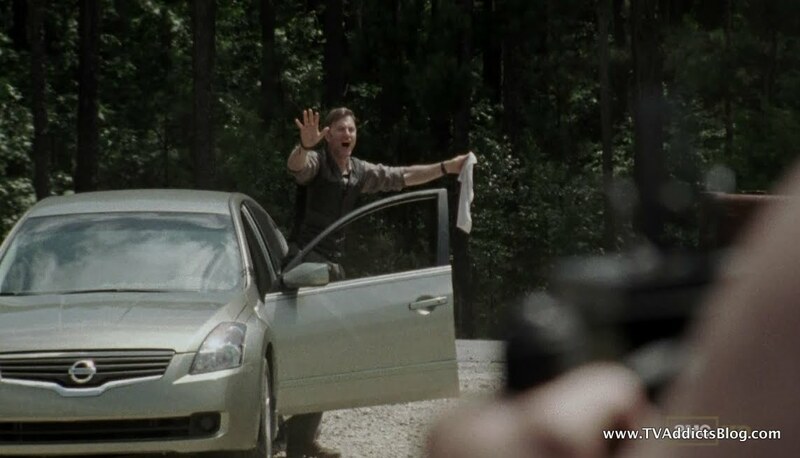 I suppose it's safe to say the Governor has some issues. It'll be interesting to see where that goes what with the heads still being alive. In Kirkland's interview I was surprised to find out the town they're shooting in is still open for business, and that for the restaurants and shops the residents just go in the back doors! Couldn't believe that we lost the 'pets' so soon. Funny you should say 'same old merle' cause I saw a very different Merle. 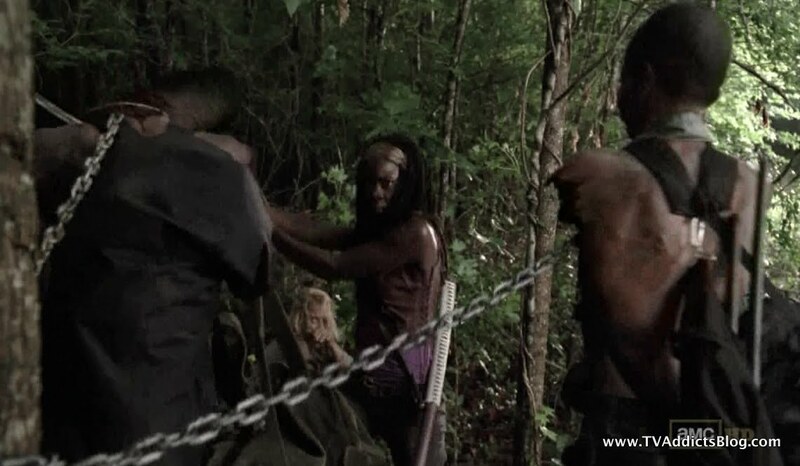 Michonne looked like a caged animal the whole ep - ready to spring ! Interesting that without feeding they lose their hunger - but then why were the pets suddenly acting up when the Woodburians were killing the army guys ? Strange that - killing the army guys. I know that we are all thinking that killing them is to protect his Govtatorship - but it seems dumb still. As they referenced in talking Dead Andrea does have a pattern of following strong people. First it was RV guy who found her and her sister, then Shane, then Rick. Good point on Merle being different. I sometimes say things that I don't really mean! I was even thinking when I wrote it that I didn't mean that. But, I'm always time crunched when I write these things! But, no excuse, I should've deleted it. He definitely wasn't the same out foul mouthed Merle that we met in season 1! He was instead a lapdog to the Governor! I'm not sure what they were reacting to but it was at that time that they started making all that noise and had to be put down by Mishonne.